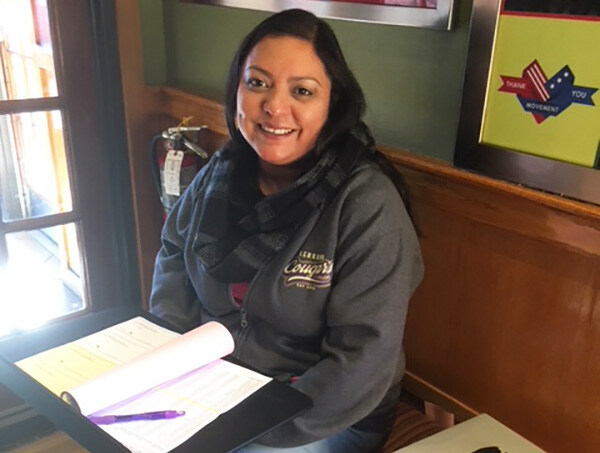 Students, family, friends, school administrators, and other members of the community gathered at Applebee’s Neighborhood Grill in Highland for breakfast Saturday morning in support of Serrano Middle School’s music program. There is broad agreement that nurturing an appreciation for music and the arts in students can spark an interest that lasts a lifetime, yet funding for such programs has dwindled over recent years, and such programs are now a shell of what they once were. Despite this reality, students across the region continue to explore their budding passions for music, largely due to the commitment of teachers like Serrano Middle School’s Ryan Webb. Webb has taught at the school for ten years and, like some of his peers, he wears several hats—in addition to music, he teaches band, jazz band, and orchestra, as well as the yearbook class. According to Webb, he learned about Applebee’s fundraising opportunities from other band colleagues in the city. Since learning about the fundraising options, he has used it to help raise funds for his school’s music programs. One of the initial fundraising opportunities he and the students participated in with the restaurant involved the use of restaurant fliers. The students gave fliers to their supporters who then dined at Applebee’s on a preassigned night, and a percentage of the proceeds from the evening was donated to the school. Applebee’s opened early Saturday morning to accommodate the fundraiser. Supporters were greeted at the door by Serrano Middle School ASB Technician, Lucero Martinez. She shared how the funds raised at the breakfast would be used for student activities and student incentives for the music program. Among those in attendance was James Cunningham who was there with several members of his extended family members to support his granddaughter, Joslin Osrio, who plays violin as a participant in the school’s music program. When asked for his opinion of the fundraiser Joseph responded, “It is really nice. It gives us an opportunity to come together as a family to support my daughter and the school as well. The food was amazing. The atmosphere was great and the service was outstanding,” he added with a smile. The Serrano Middle School music students served the buffet-style breakfast, were extremely attentive as they waited on tables and some of the students played soft-sounding string music live as those in attendance enjoyed a breakfast of pancakes, scrambled eggs, sausage, potatoes, juice and coffee. It was apparent during the morning’s event was that Ivy was not the only student who holds Mr. Webb in high esteem, evident in the enthusiastic way the students interacted with their teacher and the excellent service and attention they provided to those who came out to support them. Another clear indication of the positive rapport Webb has established with his students and the respect they have for him as their teacher was also demonstrated by the alumni who also came out Saturday in continued support of his music programs.